The following material is from the introduction to The Art of Black Africa, written by Elsy Leuzinger and published by Rizzoli (New York, 1976), with photographs by Isabelle Wettstein and Brigitte Kauf. African art is rooted in religion. This does not mean that Africans would be so presumptuous as to make images of the great creator-god. It is rather the case that they try to put the divine power, the eternal vital force which suffuses creation, into a form that befits it, thereby ensuring its favourable disposition and enlisting its aid and protection. 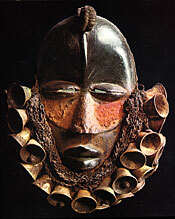 African works of art--masks, sculptures and other ritual implements--are nothing less than media designed for a supernatural power. They have to be fashioned with such beauty and precision, with such appropriateness, that they please the spirit and persuade it to take up its abode in them. This it does in special ceremonies, which the priest combines with sacrifices and invocations; at the climax of the ritual the presence of the divine spirit makes itself felt to the worshipper with the greatest immediacy and intensity. . . . 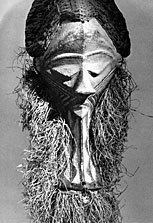 The mask usually bears the features of the ancestor figure, but serves a different function: it is a dynamic ritual implement, which intervenes actively in the ceremonies. Its significance can only be appreciated by one who has seen it perform this function: in the light of the moon and the torches the mask-bearer appears, fully costumed, and suggests the presence of the great spirit by wild leaps and dances, speaking with an unnatural voice. 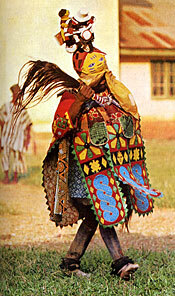 Indeed, the mask-bearer is convinced that during his trance, in an atmosphere heightened by odours of sacrifice and the rhythmic beating of drums, he is possessed by the divine spirit, which pulsates through his body like an electric current. . . .
Kindly souls appear in white masks, sometimes even dancing on stilts to look as supernatural as possible. With piping voices they announce the counsel given to the bereaved from the dignity. Festivals connected with the sowing of crops and harvesting, legal proceedings, ceremonies held for boys completing the bush school--on all important occasions the tutelary spirits are invoked and acclaimed. Every ritual act, every ceremony performed by the priest, gives the African a sense of security and an assurance that each evil spirit is counteracted by a kindly one.